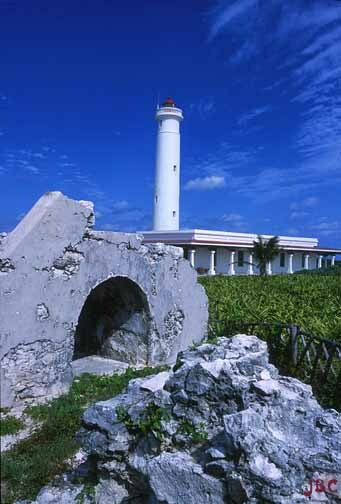 Punta Celarain is located on the southern tip of the island of Cozumel. 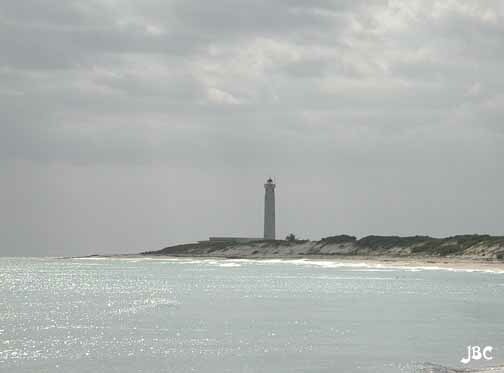 Back in 1992, when I first went there, the lighthouse could be accessed by anyone willing to walk or ride whatever mode of transportation they had, along a very sandy and bumpy road along the beach. It was deserted and somewhat run down. Lots of trash and no access inside the tower or buildings. But it was neat to drive in on our mopeds and have lunch, maybe escape a short tropical shower. Now it is a park and you have to pay to enter at a gate right by the paved road. It is right at the south end where the road curves back to the northeast to continue to the northern point, Punta Molas. There are roadside establishments on both sides of the road. You can see the lighthouse from there, but come on, you just spent a thousand or so to come to the island, so why not another 5 bucks. They have fixed it up very well. Decks take you out into the marshes where you can see many varieties of water birds as well as alligators. You park at a Hospitality Hut/Interpretive Center and listen to the spiel about the area and the park. They take you down to the lighthouse in a double decker truck and drop you off. You can stay for however long and the tower is open to the public. There are other small ruins around as you can see in the above picture. The lighthouse is maybe 100 feet tall or so. I have not seen its flash pattern and they didn't say inside. The building at the base of the tower is now a museum and there are several park employees that tell you about the area and the light house. One of the most amazing things I learned about was El Caracol. You simply must check it out. Just click that link back there. I walked back to the parking lot. You can walk up the sand dune between the road and the beach, which is nice and sandy by the way, if you like to swim, these are wonderful beaches. Anyways, walk up the dune and look back at the light house. Many good photo opportunities at this lighthouse which in Spanish is called El Faro. You know, I look at that word and I think back to the very first lighthouse called Pharos, at Alexandria, Egypt. Hmmm.